One of my new favorite ingredients: Quinoa. Seriously, where have you been all my life? 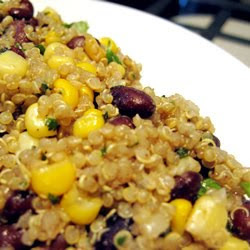 Quinoa is one of those healthy ingredients that might scare a lot of people. If it is so healthy, how can it possibly be any good? Let me tell you, it is awesome. You could use it instead of rice in a lot of recipes. Let me tell you, it is a lot more palatable than brown rice. It is becoming more and more available. In fact, quinoa is probably better for you than brown rice. It is a complete protein and a good source of fiber among other things. You can pick it up for a good price at Trader Joes or Winco. Who knows, you may be lucky enough to find it in your local grocery store. This recipe is a great recipe to try it out. Trust me, it is delicious! 2. Mix quinoa into the saucepan and cover with chicken broth. Season with cumin, cayenne pepper, salt, and pepper. Bring the mixture to a boil. Cover, reduce heat, and simmer 20 minutes. ***Serve with a small dollop of sour cream for added deliciousness. I have a similar recipe for burritos that has the corn and quinoa, too. It really is tasty. And I've never EVER liked brown rice, so it's a nice change. The texture is a little bit like cooked hamburger, too, so if you're looking for a food storage item to use in place of ground beef, it's a good solution. I remember hearing about it on Biggest Loser years ago and couldn't find it until recently. Costco also carries it, but you can buy it in bulk at Winco.